What Should I expect if I choose Spray Foam Insulation? Inadequate insulation and air leakage are the leading cause of energy waste in your home. Polyurethane Spray Foam (closed cell) will seal cracks thus stopping energy waste and reducing energy consumption. It only makes sense to use an insulation that provides you with the highest R-value. The right insulation can reduce your utility bill and provide you with a more comfortable, healthier home. Here are some of the reasons why Eco Construction Group strongly recommend spray foam versus other insulation types on the market; for example Batt or Blown In Insulation. Spray foam does not allow air loss or air infiltration into your home. This seal effect on the envelope of the home is a major difference between spray foam and other types of insulation. A major point we express to our customers is by spraying the roof deck area you create an insulated attic for the HVAC ductwork to flow in and out of. This creates less stress on the HVAC which allows the units to operate as efficient as possible. True R-Value is not only factored by the materials used. It can also be factored by Air transfer through different construction materials for instance the continuous bond that is created when spray foam is correctly applied to a roof deck virtually eliminates Air Transfer which increases the R Value Performance significantly vs Batts or blown in. True R Value must be evaluated to look at the apples for apples characteristics when you compare the R Value of Spray Foam to the R Value of Batt or Blown In Insulation. Polyurethane Spray Foam (closed cell) insulation is a cost effective method of reducing wind and water losses associated with hurricanes, high wind, and rain events. Polyurethane Spray foam can be applied to both existing and new construction homes. The spray foam is applied at a 2.5″ (Closed Cell) average to the underside of the roof sheathing thus sealing and bonding the sheeting to the rafters. Two inches is applied to all exterior walls adding strength, moisture barrier and allowing space for the electrical and plumbing for future growth. Polyurethane Spray Foam creates a seamless, monolithic barrier against moisture intrusion. Don’t take our word for it ask your insurance carrier on the costs savings for your annual premium when you incorporate closed cell spray foam to the roof decking. This bond will give you lasting energy savings while increasing the bond or strength of your roof system to take on the worst weather Mother Nature produces. The bond that Spray foam creates for the building envelope rejects pollutants from entering the house, including dust and dirt, mold and moisture, radon and carbon monoxide. This is an important factor when you consider we spend nearly 90% of our lives on average indoors. Also once you achieve the continuous building envelope seal this virtually eliminates water intrusion along the fear of the growth of mold, which release spores and micro toxins into the air. One of the most important features that spray foam insulation prevents is the reduction of pollutants, outdoor allergens and moisture from infiltrating the building thus providing your home with fresh clean indoor air quality. Polyurethane Spray Foam (close cell) is a total moisture barrier as well as an air barrier Polyurethane Spray Foam (close cell) does not allow heat to enter the attic. Therefore, there is no need for ventilation. This ventilation can actually work against you by drawing the conditioned air out of your house and exhausting it through your roof. Typical old construction practices introduce venting in the attic for the warm air to escape from the unconditioned space. 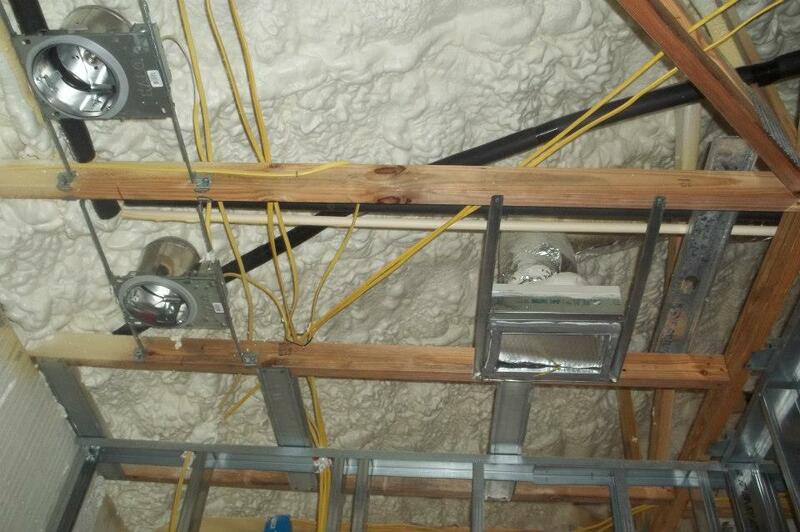 This is a building practice we hope to eliminate with the use of closed cell spray foam. The attic when incorporated with closed cell spray foam will be a closed system thus less roof vents which help minimize the opportunity for future leaks on your roof. Often owners resign themselves to paying high-energy bills. However, the cost of energy will never decrease. In the past decade Energy Costs have spiked by nearly 40% per kilowatt hour. Air Conditioning accounts for 50 to 70% of the energy use in your home, Spray Foam will help reduce this usage by minimizing the workload for your HVAC System. The return on the cost of spray foam vs Batt or Blown in Insulation is typically made back in less than 5 years. With all of the features and benefits that Spray Foam creates not only on your monthly power bill but also on your home’s increased resale value, the choice becomes clear to have Eco Construction Group incorporate Spray Foam into your new home or retro fit your existing home to the best insulation on the market.